Versatility: They can be placed on most flat surfaces. They are quick and easy to install and can be taken away and/or replaced just as easily. 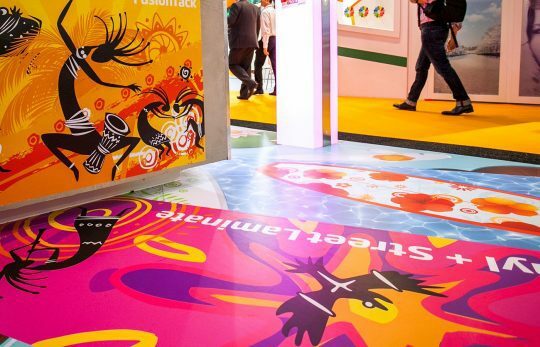 Directions: Floor Graphics can be used as a way of guiding your customers around your store, to a special promotion or even to an event. You can use arrows or something more fun like footprints. Clearly marking the path you want your customer to go. Promote sales, products and special events: Floor graphics can often have a better impact than a traditional poster on the wall. You also tend to notice a bright, well designed graphic that you are about to walk across and it is more likely to stick in your mind then generic sign or posters, that often get overlooked. Replaceable: Used for short to medium term use, they can easily be removed when the event, sale or special offer has finished. It’s also quick, easy and very cost effective. *do not apply to painted floors as it could remove paint when the graphic is removed.